We’re not a cooking or foodie site, but there is that sweet point where cooking/food and science meet, and we absolutely have to savor that point. Enter Kuru-Kuru Nabe, the self-stirring pot. Why would anyone want a self-stirring pot? Think about it. Anyone who has had to prepare lunch or dinner while having to pay attention to other pressing matters (READ: multitask) would immediately know how easy it can be to burn food simply due to unintentionally NOT stirring the pot. With the hectic lives that many people live today, I think that this is not an uncommon occurrence in the kitchen. That’s why I think Kuru-Kuru Nabe is brilliant. 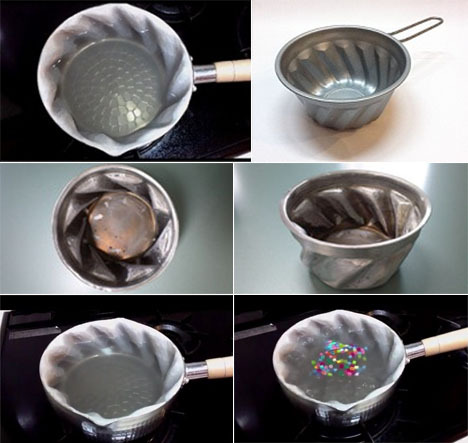 The self-stirring pot is the brain child of a Japanese inventor – not really surprising, is it? While he does not seem to want the fame (we can’t seem to find his name), his invention is so simple that it is almost amazing. The strength of the self-stirring pot is in its shape. The run-of-the-mill pots that we see in every kitchen are plain. Most of the time, at least. On the other hand, Kuru-Kuru Nabe has fluted sides following a precisely calculated angular pattern. As you can see from the photos, the fluted sides pave the way for the liquid in the pot to follow a natural flow, thanks to convection. Thus we have the self-stirring action. It seems that the principle can work, although I have a feeling that for certain dishes, nothing will beat manual stirring. Here’s a cool video of the self-stirring pot, though.